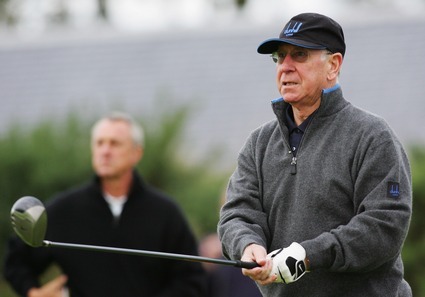 Watched by fellow football legend Johann Cruyff, Sir Bobby Charlton tees off at the Alfred Dunhill Links Championship. As well as Charlton and Cruyff, Ruud Gullit and Matt le Tissier are among the ex-pros who turned up to play in the tournament in Scotland. Most frightening strike partnership ever? Honestly, who cares?! Slow day in the office boys?